The Red Sox fessed up and then counter-snitched on the snitchers with their own photographic evidence that the Yankees were stealing signs, too. 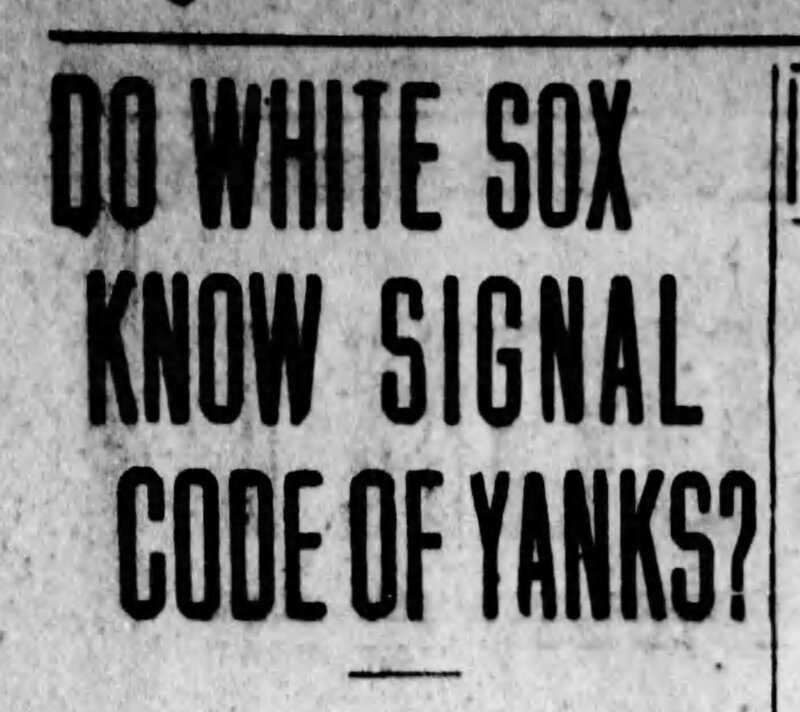 The Red Sox weren’t the first Sox to decode the Yankees. A few sign-stealing stories for you. I wish I could remember who first told this joke on Twitter. I polished it up, so I get part credit for that. But, in a post about stealing things, I don’t want to be seen as a Tweet-stealer. Reporter: So, were the Red Sox stealing signs? Red Sox Manager John Farrell: Not on my watch. Reporter: So they weren’t stealing signs? Farrell: No, I mean, it wasn’t on MY watch. During the 2004 World Series, Red Sox slugger Manny Ramirez was at bat and got into a heated argument – in Spanish – with Cardinals catcher Yadier Molina. The umpire signaled for Francona to come out of the dugout and help calm things down. “Manny, what’s this about?” Francona asked. One general manager, unnamed, told a reporter last week, “Everyone does [it].” It was the brazenness of the sign stealing – and the Apple watches – that did in the Red Sox. 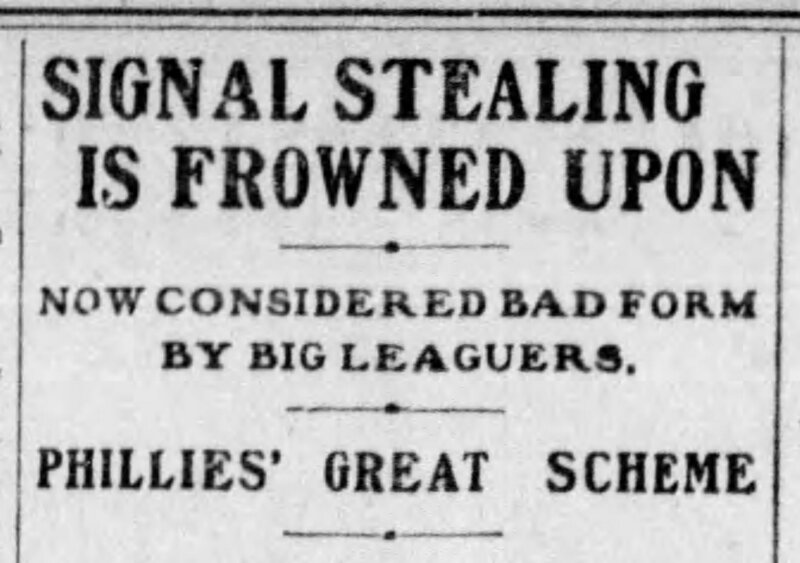 But, they weren’t nearly as brazen as the sign-stealing 1899-1900 Philadelphia Phillies. 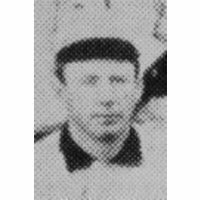 “There was a clever little catcher named Morgan Murphy who was smart and quick and who grew too fat to catch,” sportswriter Hugh Fullerton recalled a few years later. 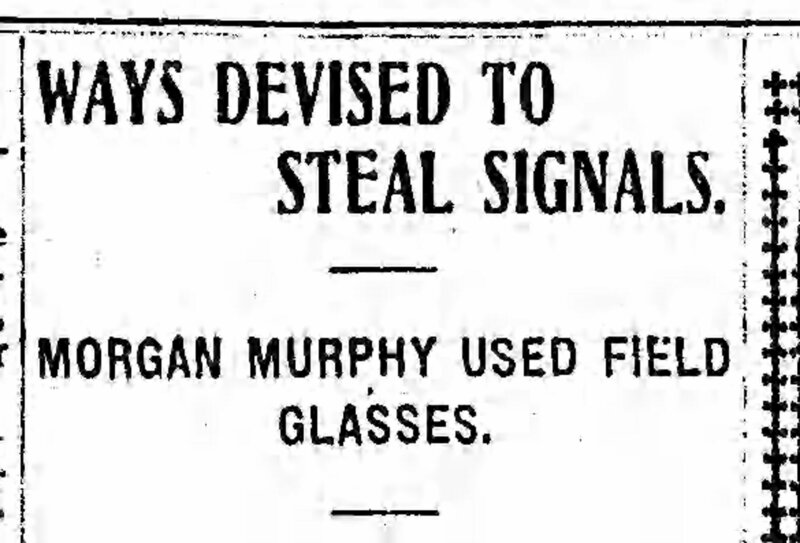 Murphy hatched a plan to sit in the center field clubhouse with field glasses, pick up the catcher’s signs, and signal back to the Phillies third base coach, Pearce “Petie” Chiles, who would then tip off the batter. The initial signals were primitive – from the window in his outfield room Murphy would hold a rolled newspaper sideways for a curve, straight up for a fastball, or move a window awning up or down. For road games, he would rent rooms in the other parks where he could get a good look at the catcher. The Phillies were found out, other teams knew they were stealing signs, but they couldn’t beat Murphy. When a Louisville Colonels catcher caught on to the Phils getting his signs, he stopped signaling pitches at all. Murphy sent a boy to the dugout to tell the team there were no signs. The Phillies eventually realized the catcher was signaling for a curve by smiling at his pitcher. Jack Warner, the Giants catcher, tried to outfox Murphy with mouth signals, eye blinks, and even getting the third baseman to give the signs. But, Murphy would figure it out. Everybody knew they were doing it. Frowned upon, people. Frowned upon. 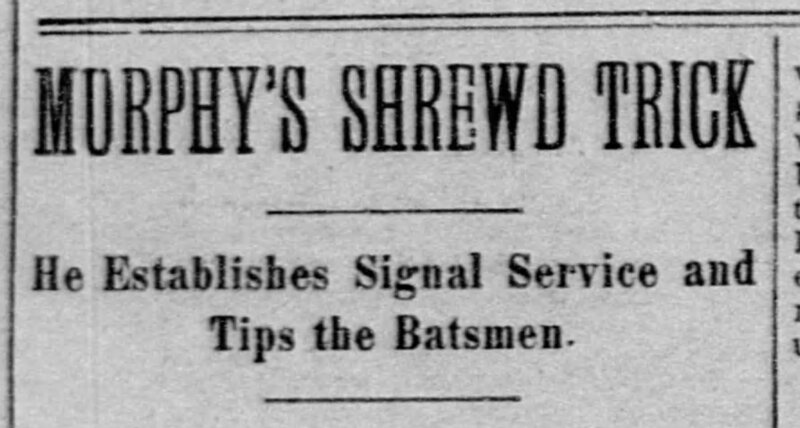 Sometime during the 1900 season, Murphy and Chiles stretched a wire from the center field clubhouse, pressed it under the turf, and connected it to a cigar box rigged with a battery and telegraph tapper which they buried under the third base coaching box. The tapper would jolt Chiles in the foot when Murphy pressed a buzzer in the clubhouse to signal the upcoming pitch. In September, the Cincinnati Reds finally figured it out – Chiles’ constantly quivering leg was the giveaway – stopped the game and dug up the box. Phillies players, the groundskeeper, and, in some reports, the police, converged on the Reds to try to stop them. The Phillies buzzer scandal clearly didn’t end sign stealing in baseball, it didn’t even stop the Phillies, who were caught a few weeks later doing it again. But it ultimately did in Murphy – who disappeared after the season – and Chiles – a career con man who wound up in prison the next year (and may, or may not, have escaped). What if the Giant’s Bobby Thomson’s home run in 1951 off of the Dodger’s Ralph Branca — “the shot heard round the world” that sent the Giants to the World Series — was thanks to a stolen sign? Coulda been, because that season the Giants had their own sign-stealing system. If you haven’t had enough baseball cheatery, then read Joshua Prager’s excellent The Echoing Green that uncovers and unfolds the entire thing, while telling the story of how Thomson and Branca, entwined together forever thanks to that one at bat, came to terms with it and the sign stealing — together — later in their lives. This entry was posted in Baseball, Baseball History and tagged Boston Red Sox, Brooklyn Dodgers, cheating, New York Giants, Philadelphia Phillies, Sign Stealing by Jackie, The Baseball Bloggess. Bookmark the permalink. “I saw the light, I saw the light. I thought Hank Williams did that. Now I find it was Wilbert Robinson. Learn something new every day. 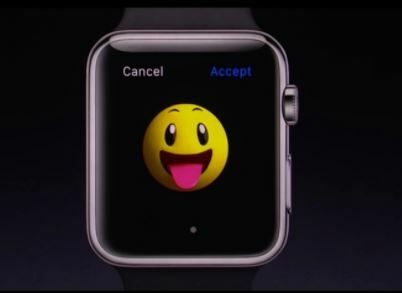 Next we’ll have catchers texting their signals to the pitcher via Apple watches. Ain’t technology great!?! Loved the way you told this story. That’s been the chatter this week … give pitchers and catchers headphones so they can walkie-talkie the signs to each other. And, then how long ’til the other side learns to hack in to that? “I’m shocked, shocked to find that gambling is going on in here!” Not everyone can be Christy Mathewson (or even aspires to be, alas). “I’m shocked … shocked!” That line is going to be in my head all day … perfect! “The Echoing Green” is a great book … both the way the 1951 season is told, the way the sign-stealing unfolds, and, how Thomson and Branca ended up in this uneasy relationship. Eventually, Branca knew — he KNEW — that the home run off of him was probably tainted, yet, he kept it to himself. He had this strange loyalty to the game and, strangely, Thomson. It really is an interesting story of two conflicted and complex men. Ooo-kay, now we’re talking about what constitutes actual cheating in Baseball- as opposed to simply outsmarting (or staying one step ahead of) the other team- and I see that the line isn’t all that clear. Let’s say that Bonds, Conseco, Susa, A-Rod and the rest were cheating, when they dosed themselves. They weren’t doing it for their team, they were doing it for themselves, only; for their own glory (and profit). Given the fact that their managers, trainers and team mates knew what they were doing, was this more or less “cheating”, than stealing signs? I’m not at all sure. Does tradition make a difference? We know- because they’ve told us- that players have been dosing themselves with uppers for decades, to help them deal with the grind. Was that cheating? Does the fact that players have been doing it for so long wrap it in tradition, and thus make it something other than cheating? All I’m saying is that we’re talking about a very hazy, movable line, here, between a team trying to get some kind of edge, and a player trying to get the same thing- with the team’s knowledge. So what? I dunno, I’m just saying it’s a lot more ambiguous than some people are making it out to be. That’s all. I guess you can’t anticipate the invention of smartphones and the internet or drones any more than you can anticipate the invention of HGH and steroids, or a team hacking into another team’s computers (Hi, Cardinals, we haven’t forgotten about you!). You have to deal as the problem arises. Baseball is, I think, going to have to continue to work through these issues one by one, because who knows what will come up next. So, I’m not sure it is an ambiguous, hazy, movable line really, is it? It’s a line that is adjusted when new realities appear. I think Christy Mathewson’s line “without outside assistance” is a good and easy baseline for sign stealing — eyes, mind, hands are ok, but no buzzers, electronics, or whatnot. But, as one GM said last week, everyone does it and every dugout is just “two steps away” from all the electronic gadgetry in the clubhouse. The mistake that the Red Sox made, I guess — like the pitcher who has just a little too much goo on his cap — was to get caught. Oh Bloggess, you’ve made my day – this was such a treat! I loved every rascally bit of it, especially Murphy, Chiles and the wire. That was some mad genius. And now I’m reminded of one of my Dad’s favourite stories. Though it’s not about sign-stealing, there is some skullduggery involved so I hope you won’t mind. My Dad’s cousin (by marriage) was Vic Lombardi, a pitcher who’d played for Brooklyn and Pittsburgh in the ‘40s. After his major league career, he spent time in the Pacific Coast League – playing for Portland, I think. Anyhow, during a game against the Sacramento Solons, a batter complained that Vic was throwing a spitball. So the ump stepped out and asked for a look at the ball – Vic complied by rolling it to him through the wet grass. My father, who was just a kid watching it on TV, thought it was one of the funniest things he’d seen. I had to think on this one — its frustrating to me that this has been going on for so long and yet expected. I love the wire story – holy cow they were inventive! So I am guessing that the glove in front of their face really serves no purpose any longer? It just makes me think do they really even talk or just say random things and discuss dinner plans! If there’s a runner on second, I’m guessing the catcher is going out to the mound to change the signs … so the other team will have to decode everything again. I think it’s just an accepted part of the game … as Christy says, if you use your eyes, mind, and hands, it’s ok to try to figure the pitcher out. All of today’s technology would amaze him, I’m sure! Have you ever thought of submitting your stuff to the New York Magazine or the New Yorker? I’d for sure submit the one on bad sandwiches from that church in PA.